Please Click on the Jewelry Class Calendar Tab for Class Dates and Locations. Private and Small Group Instruction is Also Available. Please check the Private Class pages for more information. 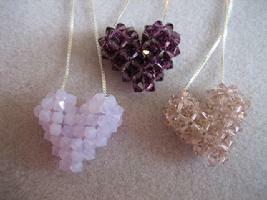 Swarvoski Crystal Heart Pendant: I've never seen a crystal heart I didn't like! This 3-D heart necklace is beautiful in any shade. Come join us to create a sparkling addition to your necklace wardrobe, or create a beautiful gift for someone special. 16-18 Inches Fine Chain with clasp. Princess Pillow: Swarvoski bicone crystals are woven into a square that is "puffy" like a pillow. Your pendant can be hung on a chain as a square, or turned on a 45 degree angle and worn as shown. 1 and 1/2 yards monofilament (illusion cord). GS Hypo Cement jewelry glue and a 16-18" neck chain.